Hmm, I can't quite put my finger on it but there's something creepy about these pictures. 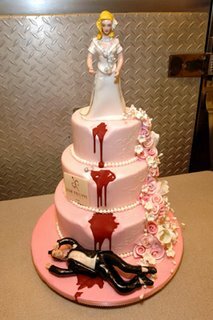 Oh I got it - it must just be the blood on the cake! Funny cake, but she's not really being the bigger person in the situation. I bet it was an awesome party though. More male bashing or is this just bad taste?